Longitudinal section of female flower of squash showing pistil (=ovary+style+stigma), ovules, and petals. The petals and sepals are above the ovary; such a flower is said to have an inferior ovary, or the flower is said to be epigynous. In the flowering plants, an ovary is a part of the female reproductive organ of the flower or gynoecium. Specifically, it is the part of the pistil which holds the ovule(s) and is located above or below or at the point of connection with the base of the petals and sepals. The pistil may be made up of one carpel or of several fused carpels (e.g. dicarpel or tricarpel), and therefore the ovary can contain part of one carpel or parts of several fused carpels. 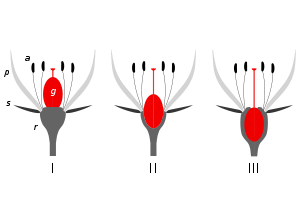 Above the ovary is the style and the stigma, which is where the pollen lands and germinates to grow down through the style to the ovary, and, for each individual pollen grain, to fertilize one individual ovule. Some wind pollinated flowers have much reduced and modified ovaries. A fruit is the ripened ovary or ovaries—together with seeds—from one or more flowers. The fruits of a plant are responsible for dispersing the seeds that contain the embryo and protecting the seeds as well. In many species, the fruit incorporates some surrounding tissues, or is dispersed with some non-fruit tissues. Locules are chambers within the ovary of the flower and fruits. The locules contain the ovules (seeds), and may or may not be filled with fruit flesh. Depending on the number of locules in the ovary, fruits can be classified as uni-locular (unilocular), bi-locular, tri-locular or multi-locular. Some plants have septa between the carpels; the number of locules present in a gynoecium may be equal to or less than the number of carpels, depending on whether septa are present. The ovules are attached to parts of the interior ovary walls called the placentae. Placental areas occur in various positions, corresponding to various parts of the carpels that make up the ovary. See Ovule#Location within the plant. An obturator is present in the ovary of some plants, near the micropyle of each ovule. It is an outgrowth of the placenta, important in nourishing and guiding pollen tubes to the micropyle. The ovary of some types of fruit is dehiscent; the ovary wall splits into sections called valves. There is no standard correspondence between the valves and the position of the septa; the valves may separate by splitting the septa (septicidal dehiscence), or by spitting between them (loculicidal dehiscence), or the ovary may open in other ways, as through pores or because a cap falls off. The syncarpous ovary of this melon is made up of four carpels, and has one locule. In this Peganum harmala, the ovary of a fruit has split into valves. The valves of Lunaria fruit fall to reveal a septum that was between the two carpels of the ovary. Ovary insertion: I superior II half-inferior III inferior. a androecium g gynoecium p petals s sepals r receptacle. The insertion point is where a, p, and s converge. The terminology of the positions of ovaries is determined by the insertion point, where the other floral parts (perianth and androecium) come together and attach to the surface of the ovary. If the ovary is situated above the insertion point, it is superior; if below, inferior. A superior ovary is an ovary attached to the receptacle above the attachment of other floral parts. A superior ovary is found in types of fleshy fruits such as true berries, drupes, etc. A flower with this arrangement is described as hypogynous. Examples of this ovary type include the legumes (beans and peas and their relatives). A half-inferior ovary (also known as “half-superior”, “subinferior,” or “partially inferior,”) is embedded or surrounded by the receptacle. This occurs in flowers of the Lythraceae family, which includes the Crape Myrtles. Such flowers are termed perigynous or half-epigynous. In some classifications, half-inferior ovaries are not recognized and are instead grouped with either the superior or inferior ovaries. More specifically, a half-inferior ovary has nearly equal portions of ovary above and below the insertion point. Other varying degrees of inferiority can be described by other fractions. For instance, a "one-fifth inferior ovary" has approximately one fifth of its length under the insertion point. Likewise, only one quarter portion of a "three-quarters inferior ovary" is above the insertion. An inferior ovary lies below the attachment of other floral parts. A pome is a type of fleshy fruit that is often cited as an example, but close inspection of some pomes (such as Pyracantha) will show that it is really a half-inferior ovary. Flowers with inferior ovaries are termed epigynous. Some examples of flowers with an inferior ovary are orchids (inferior capsule), Fuchsia (inferior berry), banana (inferior berry), Asteraceae (inferior achene-like fruit, called a cypsela) and the pepo of the squash, melon and gourd (Cucurbitaceae) family. ^ Soltis, Douglas E.; Fishbein, Mark; Kuzoff, Robert K. (2003). "Evolution of Epigyny". International Journal of Plant Sciences. 164 (S5): S251–S264. doi:10.1086/376876. ^ Soltis, Douglas E.; Hufford, Larry (2002). "Ovary Position Diversity in Saxifragaceae". International Journal of Plant Sciences. 163 (2): 277–293. doi:10.1086/324528.